Kenyan Inspector General of Police, Joseph Boinnet, on Wednesday, revealed chilling details of the recent foiled terror attack, which is said to be one of the most successful arrests in recent times. 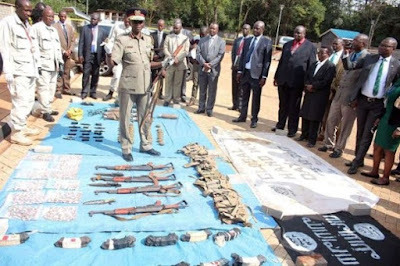 Mr Boinnet said that the vehicle with registration number KBM 200D that was seized from the suspects in Merti, Isiolo County, was laden with approximately 80kg of high-grade Trinitrotoluene (TNT) explosives. The police boss revealed that the vehicle, which would have been used as a Suicide Vehicle Bound Explosive Device (SVBIED), was set to be driven to Nairobi and would have killed hundreds of innocent civilians. Police found five AK-47 assault rifles, 1,099 rounds of ammunition, and 36 fully loaded magazines in their car. A third suspect was killed at the scene in Yamincha, while two others escaped. “Typically, terrorists prefer ramming an SVBIED on a gate or main entrance to the target. To avoid premature detonation.” he said during a press conference outside the DCI Headquarters’ Forensic laboratory. “The bomb would have destroyed buildings, vehicles, and infrastructural structures nearby besides killing hundreds of people within a radius of 250 metres,” he said. An expert attached to the Bomb and Hazardous Disposal Unit explained that just a kilogramme of TNT can cause destruction in up to 11 metres radius from the epicentre. The recovered explosives weighed 100kg in total.